The Chartered Accountants Intermediate (IPC) Examination is held twice in a year in the months of May and November. 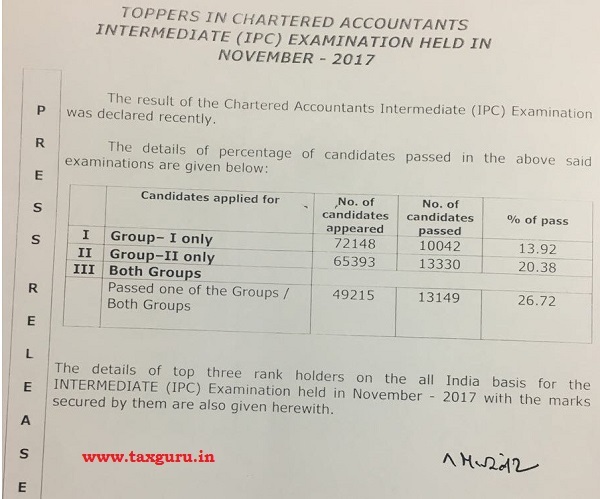 Result of the Chartered Accountants Intermediate (Integrated Professional Competence) Examination held in November 2017 declared today. I. The result analysis of the Chartered Accountants Intermediate (IPC) Examination in terms of number of candidates appeared, number of candidates passed and the pass percentage. The result of the Chartered Accountants Intermediate (IPC) Examination was declared today i.e. 28th January 2018 (Sunday). III. For your reference, placed below is the data for Chartered Accountants Intermediate (IPC) Examination held in November 2017.